The 16" Select Home Chocolate Fountain holds a capacity of 4 lbs of fondue. Perfect for parties of up to 30 guests. Model CF16E-SST. FREE GROUND SHIPPING! with Sephra has been a 10. Easy to use with quiet operation. A great hit for any party! I'm very impressed and pleased with how well this chocolate fountain worked out for our office holiday party! The parts are very easy to assemble, almost no instruction required. 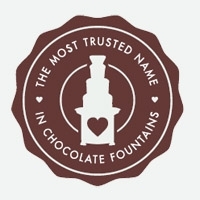 I didn't heat chocolate in the fountain itself so I do not know how long it would take to melt down if I attempted to heat the chocolate solely in the base of the fountain. I put in 4 lbs of the melted chocolate into the already warmed up base, then I ran the auger at on/off intervals of about two seconds each for half a minute. After that it ran quietly like a champ for the rest of the night. Requiring only one top off. The kids at the party couldn't stop coming back to dip strawberries and pretzels in the fountain! Cleaning was a little bit of a hassle considering the chocolate contains oils which leave a residue on all of the plastic parts. I used a sponge loaded up with dish soap and hot water to help remove the chocolate and that did the trick.